The Alien and Sedition Acts of 1798 were four laws that were passed by the predominantly Federalist Congress and signed by John Adams to strengthen the national security of the United States. These acts not only restricted the ability of an immigrant to become a citizen, but made it easier to deport non-citizens who were either deemed dangerous or were citizens of hostile countries. Perhaps the most contentious aspect of the new laws criminalized the printing or speaking allegedly false statements about the federal government. Not surprisingly, these laws were incredibly controversial and strongly opposed by Thomas Jefferson's opposition Democratic-Republican party. 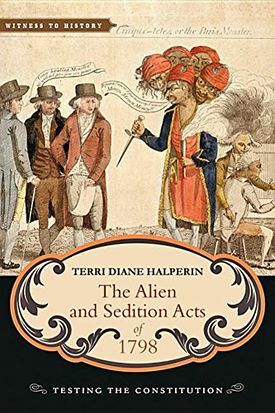 Terri Halperin's new book The Alien and Sedition Acts of 1798 published by Johns Hopkins University Press lays bear the deep divisions in the United States that potentially threatened the survival of the young nation. She examines the passage and strident debate that around these laws along with their problematic an uneven enforcement. Her book is excellent introduction to both the immigration laws of the new country and its interpretation of freedom of speech. 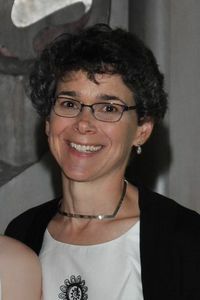 Terri Halperin is a member of the University of Richmond History Department and an adjunct professor of the James Madison Memorial Foundation Summer Institute. She is an United States historian and her focus is on the Early Republic. Here is our interview with Terri Halperin. How did you become interested in the Early Republic? After college, I worked as a legislative aide for a congressman. Part of my job was to help him with his whip duties by taking an initial poll of members. Having this small role in the leadership made me think about how Congress worked at its beginnings. My dissertation was a history of the United States Senate from 1789 to 1821. Why did you want to write about the Alien and Sedition acts? I have been teaching a class exploring the issues of debate and dissent in America from Colonial times through the Civil War for several years. The Alien and Sedition Acts are a major focus. I have been thinking about these issues for a while and was excited by the opportunity to write about them. The XYZ Affair was the trigger for the passage of the Alien and Sedition Acts of 1798. Why had the relationship between the French government and the United States soured? What was the XYZ affair? The Franco-American relationship soured in 1795 when the United States signed the Jay Treaty with Great Britain. France believed that the Jay Treaty violated its own treaties with America signed in 1778 during the American Revolution. In the summer of 1796, the French government issued a secret decree authorizing the capture of neutral ships. These actions set off the Quasi-War between the United States and France. 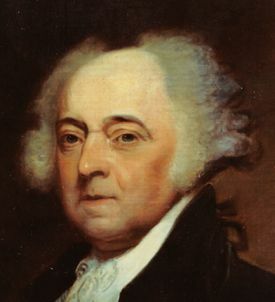 President Adams sent envoys to France to try to resolve the conflict. The French demanded bribes and other payments before they would negotiate with the Americans. The Americans refused and in their dispatches back to the American government, they identified the representatives of the French government as X, Y, and Z. Thus the incident was called the XYZ Affair. After the diplomatic mission failed, the Federalist-controlled government moved to shore up the country’s defenses. Federalists saw the Alien and Sedition Acts as defense measures. Did the outbreak of violence and protests after the XYZ affair threaten the survival of the republic? How serious a threat did they truly represent? It depends on your perspective. Federalists certainly believed that the republic was under threat, both from citizens and foreigners who were bringing radical ideas from Europe to the United States. Democratic-Republicans did not believe the same level of danger existed. They saw the danger coming from the Federalists who controlled the government and threatened people’s rights. It is hard from our perspective to gauge how serious the threat really was considering we know how it turned it out and that the republic survived the 1790s. I do think that we have to take the Federalists concerns as sincere to understand why they acted as they did and not simply dismiss them as paranoid. I remember I was stunned when I first learned that John Adams had advocated the passage of the Alien and Sedition Acts. How did Adams justify the passage of the laws? Did he understand that they undermined the principles set down in the Bill of Rights? I think that Adams’s role and his views are more ambiguous. For passage of the laws, I focused on the debate in the House of Representatives. For me the more interesting story involved arguments for and against the bills and how the bills evolved during the debate. As was typical of that time, Adams did not involve himself in congressional debates. While Adams supported the laws when passed, his enthusiasm waned when it came to enforcement. By the end of his presidency, he was at odds with many members of his party who remained staunch believers in the laws. The interpretation of the First Amendment has changed over time. Was there more than one interpretation of the freedom of speech at the time? How did Americans react to the Alien and Sedition acts? When the Bill of Rights was ratified, I do not think anyone really knew what its scope or impact would be. The Bill of Rights applied only to the federal government and not to the states. Many states had sedition laws, even states whose declarations of rights protected speech and the press. There was no consensus about what freedom of speech meant. That was part of what was debated in 1789-1800 and after. Although all agreed the government could not control speech before the fact (for example, require printers to get a license), they did not agree what could happen after the fact. Federalists argued that printers and others should be held responsible for what they said or wrote and could be prosecuted. For many, the constant agitation against their policies undermined the legitimacy of the whole government and thus threatened to destabilize the United States. They did not believe that the Sedition Act violated the First Amendment. Democratic-Republicans embraced a more modern definition of the First Amendment. Americans reacted in different ways to the laws. Certainly, many backed the laws; others exercised caution about what they said and wrote. Some people resorted to violence against printers in support of the Federalist government and the Sedition law; others used violence to oppose the laws. Some Americans wrote newspaper pieces and pamphlets, organized and attended public meetings, and wrote and signed petitions. Many people were actively involved in the debate about whether the Sedition Act in particular was a good law. Who was prosecuted under the Alien and Sedition acts? Were these trials seen as legitimate? Between 1797 and 1801, there were 17 indictments for seditious speech by the federal government: 14 under the Sedition Act and 3 under common law, which had been initiated before the Sedition law was passed. Twelve of the people indicted for sedition were printers or somehow connected to that business. Adams’s administration specifically targeted the major Democratic-Republican newspapers and successfully brought indictments against four of the five of them. Most of the trials occurred in the spring or even fall of 1800, in the midst of the presidential campaign, which certainly added to the tensions and the drama. Even though the outcomes of the trials were pretty much foregone conclusions, the proceedings were legitimate and accepted in the legal arena even if not in the political. I think you have to recognize that the Judiciary cannot be completely separate from the political and that judges play a political role. This certainly was the case in these sedition trials. What surprised you the most when you were researching this project? I was surprised by how much the debates of 1798-1800 resonated today, especially with regard to immigrants and the role of the press. Just as politicians today grumble about misrepresentations of their views and events in the press, congressmen and others made the same complaints in the 1798. Although there was no such thing as illegal immigration during the 18th century, Federalists urged that naturalization rules be tightened to discourage immigration. They believed the recent immigrants would politically destabilize the country. On the other hand, Democratic-Republicans believed that immigrants' knowledge and skills would contribute to America’s prosperity and wanted more liberal policies. The late 17900s debate had similar fault lines as today. Did the passage of the Alien and Sedition Acts and the outcry change the understanding of the Bill of Rights? Did this incident strengthen the First Amendment? The legacy of the Alien and Sedition Acts is ambiguous. The Federalists’ defeat in the Election of 1800 in many ways was the beginning of the end of the Federalists as a national party. However, the debate did not stop states from enacting sedition laws or prosecuting people for sedition. The federal government passed sedition laws and anti-immigrant laws during World Wars I and II. In fact, the Alien Enemies Act, which passed in 1798 and never expired, was used during War World II to force Germans, Italians, and Japanese to register with the federal government. The Alien and Sedition Acts controversy was the first time there was a national debate about these issues. These issues would be debated many more times –some are still being debated today. How would you recommend using your book for a US history class? While its focus is on the period of 1798 to 1800, I do discuss most of the 1790s. So, a teacher could use it in an American History survey class or a class on the Early American Republic. It could also be used in a legal or constitutional history class. 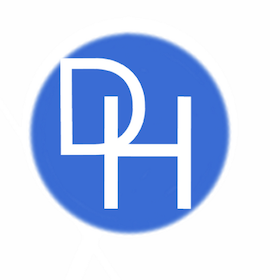 This page was last edited on 17 April 2019, at 16:53.